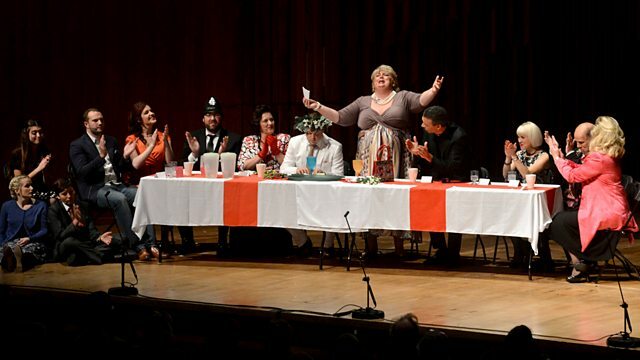 Live from the Barbican in London, a cast of leading soloists and the BBC Symphony Orchestra under conductor Steuart Bedford perform Britten's opera Albert Herring. Live from the Barbican, Steuart Bedford conducts the BBC Symphony Orchestra and a fabulous ensemble cast including Christine Brewer as Lady Billows, Gillian Keith as Miss Wordsworth, Roderick Williams as Mr Gedge and rising star Andrew Staples as Albert himself. Presented by Donald Macleod with contributions from Steuart Bedford who knew and worked with Britten, and members of the cast. Plus, in the Radio 3 Opera Guide at about eight o'clock, soprano Dame Josephine Barstow and Britten experts Paul Kildea and Christopher Wintle uncover the sophistication that lies at the heart of Brittten's comic masterpiece. In the Suffolk town of Loxford, the lax morals of the local girls preclude local worthy Lady Billows from finding an appropriate candidate to crown May Queen. Desperate times call for desperate measures and she finds a suitably virtuous May King in Albert Herring, whose domineering mother has kept him on the straight and narrow. But it only takes lemonade spiked with rum for Albert to go off the rails and discover there's more to life than than doing what mother tells him. Once again Britten found inspiration on his doorstep but unlike the grim tale of Peter Grimes from a couple years earlier, Albert Herring's affectionate parody of small-town life is a comic tour de force.